Decembers 100 Club Draw tool place on Saturday 6th in Murphy’s Bar & Restaurant, the winners were: 1st Prize £250.00 No. 65 Marty Murphy, 2nd Prize £150.00 No. 16 Annette Savage and 3rd Prize £100.00 No. 70 Carl Flanaghan. January’s draw will take place on Saturday 27th after the senior games. We still have a small selection of numbers available if anyone is interested in supporting the club they can contact Mark Murphy 07738 637702 or Tony McShane 07716 853990. Everyone at the football club would like to congratulate player Sean McMahon and partner Carla on the birth of their daughter Kassia and to our under 13’s coach Marty McGarry and wife Christina on the birth of their daughter Eliza. The first team will be looking to return to action this Saturday when they play Comber Rec in the second round of the Clarence Cup, please note this game kicks off at 1.30pm. The seconds were in action last Saturday when they took on Saintfield United 3rds in the first round of the Harry Clarke Cup, Downpatrick ran out comprehensive winners by a score-line of nine nil. Conail Kerr was the star of the show bagging himself a first half hat-trick, Marty Murphy & Daniel Smyth both bagged a brace, with Nathan McShane and Corey Ranaghan completing the score. There is no fixture this week for the seconds due to cup fixtures being rearranged. The under 18’s are in action on Friday night against Carniny, this match is at Hanwood and kicks off at 8.10pm. The under 16’s welcome Glenavon in the NIBFA Cup on Saturday morning. The under 14’s also return to action after the Christmas break when they play Hillsborough Boys on Saturday morning at Fullerton Park, this game kicks off at 11.15am. The under 13’s play Ballynahinch Olympic on Sunday morning in Dunleath, the kick off for this game is 11.40am. The 2006’s 9-a-side team are in action on Saturday morning, they play Castlewellan Town at 9.30am and Rossglass County at 10.00am, both games are in Dunleath. The 2007’s 9-a-side team play East Coast Strikers at Belvoir BB 3G pitch on Saturday morning, this match kicks off at 11.00am. 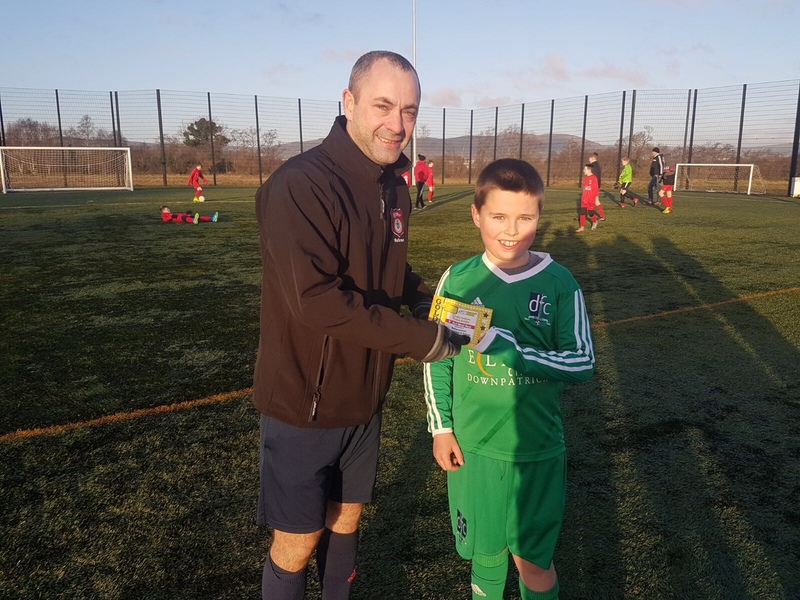 Last Saturday they played neighbours Tollymore in a highly entertaining game, pictured is Conor Powderly receiving his Man of the Match voucher sponsored by Subway Downpatrick from the match referee. Training for mini soccer will return on Monday 8th January, the training times for the different age groups are as follows: 2010, 2009 & 2008 are training from 6.00pm – 7.00pm and those born in 2006 & 2007 are training from 7.00pm – 8.00pm, they need to wear shin guards and football boots, bring a bottle of water and dress according to the weather conditions. Parents are asked to complete the registration forms as soon as possible and return them to Paul Moore or Tony McShane. Training for children born in 2013, 2012 and 2011 returns on Monday 8th January in the Red High from 6.00pm – 7.00pm. The children born in 2011 will be outside this year and those born in 2012 & 2013 will be indoors. Any questions please contact our Youth Development Officer Paul Moore on 07549 661772.